While Justin’s jam is definitely breakfast, like the really hearty, get you fueled to be productive kind of breakfast, pancakes are MY jam. 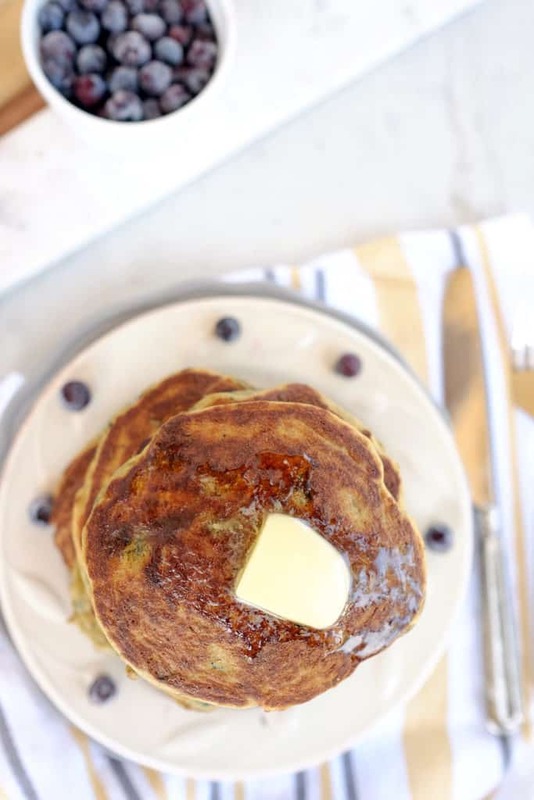 These paleo blueberry pancakes are the perfect way to ease into your weekend. I love lazy Saturday and Sunday morning breakfasts that are just a bit more indulgent. It is my favorite when we linger at the dining table and just take an extra moment to enjoy each other’s company and the tasty food on the table. Best company and food…it doesn’t get much better. This version of pancakes is all about the blueberries. I have made them with frozen blueberries we picked last summer and also with freeze dried blue berries from Trader Joe’s. I find that frozen or fresh blueberries get a little too watery, so I prefer the freeze dried blueberries for pancakes (and muffins, too). I just soak them in warm water for a few minutes before I toss them in my batter. Give it a try, and let us know what you think. Check out the fluffy goodness. 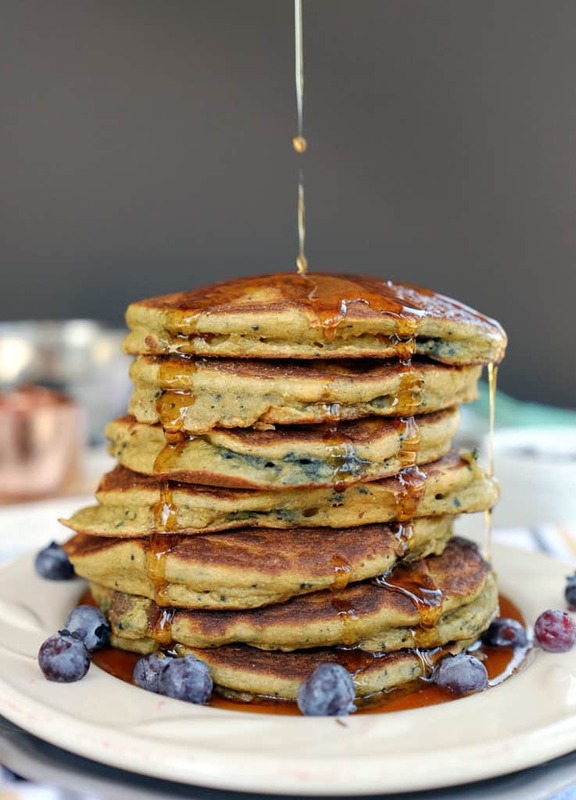 These paleo blueberry pancakes have a batter that is a bit thicker when you’re mixing it up, but the end result is a stack of pancakes that is light and airy. We love to enjoy our pancakes with various toppings, including nut butters, fresh fruit, pure maple syrup, and honey, not all at once of course! 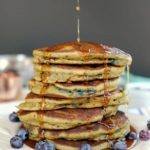 I think my favorite with these paleo blueberry pancakes is simple, just butter with a little maple syrup. Something about the blueberries mixed with maple just puts a smile on my face. A little crunchy almond butter on top wasn’t so bad either. Give these paleo blueberry pancakes a try for an indulgent and whimsical weekend morning. Let us know how you like them by leaving a comment below, and tag us on Instagram @realsimplegood so we can check it out! In a medium mixing bowl, combine all of the dry ingredients with a whisk. Add the wet ingredients and continue whisking until a smooth batter forms. Note: It will be a little thicker than your typical pancake batter. Drain your blueberries and fold them into the batter last. Heat your griddle pan or other pan of choice over medium heat. Use either a non-stick coconut oil spray...OR...for even yummier pancakes, add a little butter to your heated pan. Scoop a couple of spoonfuls of the batter into your pan and spread the batter out a little with the back of your spoon to form a larger circle shape. Remember the smaller they are the easier they are to flip, so choose your size and shape carefully. Flip the pancakes when they start to bubble. You can check to see that the bottom side has started to brown just a little. That is the perfect time to do your flipping. We like to place the pancakes on a plate in the oven with low heat (about 200 degrees) until all the pancakes are cooked so we can enjoy them together while they're warm and right off the stove. Top with your favorites. We love almond, sunflower seed, or cashew butter, grass fed butter, banana slices, fresh blueberries, maple syrup, etc. Have fun with the toppings! Thanks! They are quite tasty! Maybe Justin’s favorite! I wish tomorrow was Saturday. We do pancakes often on Saturdays. Enjoy! Love that these aren’t loaded with almond flour, and I love that action shot! These look incredibly amazing. Pinned! These look incredible! I’ll give them a try this weekend and see how they go! Thanks! These look delicious- You said these are Paleo and dairy-free; why is butter being used? Thanks for the question. It should say butter or coconut oil for the Paleo version. I will make that fix! Thanks for the catch!